With 5.2″ screen, you can now use and control Galaxy C5 Pro easily with one hand. Thanks to its full HD Super AMOLED display, image colours become more vibrant and put you right into the action, whether you are enjoying online games or movies. The device also deploys UHQA technology to uplift the sound quality for your heightened audio entertainment. Galaxy C5 Pro’s built-in 64 GB storage▲ is expandable up to 256GB to serve your downloading needs. With a Dual-SIM Dual-Standby that supports mainland China and Hong Kong telecommunication networks, the device is the ultimate companion for your work and travel. 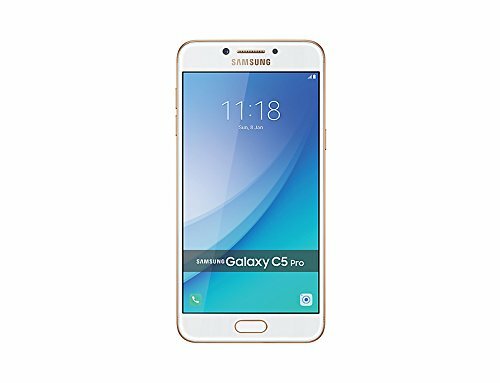 Galaxy C5 Pro is crafted from Aviation Aluminum alloy to create a smooth full metal unibody. Fashioned from the latest micro-slit technology, it is more robust, durable and stylish with a firm grip for the hands. This smartphone is ultra-slim at 7.0 mm and available in three color variants – gold, pink gold and ocean blue. This smartphone has a USB Type-C port for fast charging support▼ to allow its uninterrupted use for online games and entertainment and unhindered access to multimedia content. SIM: Dual SIM (Nano-SIM, dual stand-by), Screen: 5.2 inches, Super AMOLED capacitive touchscreen, 16M colors, Memory: 64 GB, 4 GB RAM, OS: Android 7.0 (Nougat), Chipset: Qualcomm MSM8953-Pro Snapdragon 626, CPU: Octa-core 2.2 GHz Cortex-A53, Camera: 16 MP, f/1.9, autofocus, dual-LED (dual tone) flash, Video: 1080p@30fps, Secondary: 16 MP, f/1.9. Card slot: microSD, up to 256 GB (uses SIM 2 slot). Please check if your GSM cellular carrier supports the bands for this model before purchasing, LTE may not be available in all regions: 2G: GSM 850 / 900 / 1800 / 1900 - SIM 1 & SIM 2, 3G bands: HSDPA 850 / 900 / 1900 / 2100, 4G bands: LTE band 1(2100), 3(1800), 5(850), 7(2600), 8(900), 38(2600), 39(1900), 40(2300), 41(2500).